The Natrelle 410 anatomically shaped highly cohesive silicone gel-filled breast implant was approved for use in breast augmentation, breast revision, and breast reconstruction surgery on February 20, 2013. The Natrelle 410 provides women with a long-awaited alternative to traditional round silicone gel implants. 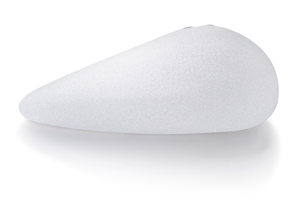 The Natrelle 410 highly cohesive anatomically shaped silicone gel breast implant is a fifth generation device that differs significantly from its round counterparts. As such, it can be considered the ‘next generation’ for breast augmentation, reconstruction, and revision surgery. It is the number one anatomically shaped gel implant world wide, and has been available in Canada since 2006 and Europe since 1993. There is more peer-reviewed data and journal publications about the Natrelle 410 than any other shaped silicone gel breast implant. The Natrelle® 410 Provides Consistent Anatomic Shape – The anatomic shape of the Natrelle 410 breast implant is designed to mimic the natural slope and projection of a woman’s breast. This implant is filled with a highly cohesive silicone gel, which allows the implant to hold its anatomic shape but still feel soft to the touch. It is this unique ability of the 410 to maintain projection in the lower pole and a gentle slope in the upper pole that makes it so special. The Natrelle 410 achieves predictable and consistent outcomes that produce a stable breast shape over time. The 410 is available in a matrix of size and shape options that gives surgeons the opportunity to provide a more individualized approach to planning and aesthetic results. For many women round saline and silicone gel breast implants are good options, and they will remain so. But for those women who seek a more natural or mature breast shape, round implants may not provide the result they desire. The availability of the Natrelle 410 now allows for greater individual specificity in breast implant selection, and provides a shaped option not previously attainable with round breast implants. Although the 410 may offer several advantages over other breast implants it is not suitable for every woman. The 410 is more appropriate for women that have a tight or average compliance of their breast and skin envelope. The 410 will not work well for women who have more significant loose skin, excess skin, breast drooping, or require a breast lift along with their augmentation. The silicone gel inside the Natrelle 410 differs from that of round gel implants. The anatomically shaped 410 is filled with a highly cohesive silicone gel. A round gel implant is filled with only moderately cohesive silicone gel. This is a very important difference. The greater the gel cohesiveness, the more structure the gel has. The more structure the gel has, the more it retains its shape. The very specific distribution of the highly cohesive gel inside the Natrelle 410 controls implant height and projection, producing and maintaining an essentially stable implant shape. The 410 is therefore often referred to as a ‘form-stable’ implant. The stability of the anatomic implant shape, even when in an upright position, allows the Natrelle 410 to maintain upper pole height and breast projection without a round shape. 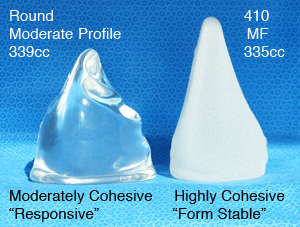 The stable shape of the highly cohesive gel, in turn, helps to shape the breast. This is the only breast implant that predictably imparts shape to the breast, and not vice versa. With the Natrelle 410, the surgeon has the ability to control breast shape in all three dimensions – height, width, and projection. By contrast, the moderately cohesive silicone gel inside a round implant behaves differently because it does not have the same degree of shape retention or subsequent predictability. When upright, the upper portion of the round gel implant collapses and this may result in loss of upper breast fullness. Some people refer to this moderately cohesive silicone gel as a “responsive gel”. Moderately cohesive gel exhibits only moderate shape retention; it is not form-stable. This makes moderately cohesive gel potentially responsive to its environment. Therefore, consistency of breast shape may be more difficult to achieve with a round gel implant, and the breast may at times impart shape to the implant. 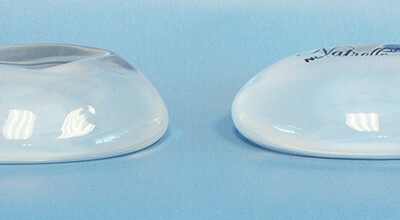 Depending upon specific patient characteristics and implant selection, round gel implants can produce varying breast shapes. Ranging from very little upper pole fullness to prominent round upper pole fullness, or from a more natural breast shape to a very round full shape. Some women desire a round breast shape and these implants are naturally suited for that. For other women the sometimes inconsistent or unpredictable shape may not be a problem or concern. But for those women who desire a natural sloping upper pole these results are unsatisfactory. Because the 410 contains a highly cohesive silicone gel filling that retains its shape, this implant has been referred to as the ‘Gummi Bear’ implant. The analogy is somewhat fitting, but the 410 is softer than most Gummi candies. And that is what makes the Natrelle 410 special and unique – it is designed to provide a shape that holds, but remains soft to the touch. Anatomic Implants Have Textured Surfaces – The Natrelle 410 has a textured surface. This BIOCELL® surface texturing is the same textured surface that is present on the Natrelle tissue expanders used for breast reconstruction. The surface texturing is designed to provide friction to hold the implant in place and help prevent rotation or malposition. If a smooth, round implant rotates within the breast pocket it does not affect the breast shape. But an anatomically shaped breast implant must remain in position to control breast shape. The BIOCELL® surface is an aggressive texturing that may also help reduce the risk of capsular contracture. Form Stable Implants Need A Longer incision – Since the highly cohesive gel filling of the Natrelle 410 has much more structure (shape retention) compared to the more conformable (responsive) round gel implant, a longer tissue incision is required for 410 insertion. For this reason, most surgeons prefer to place the implant through an inframammary approach. The 410 requires a precisely shaped pocket that closely approximates the dimensions of the implant; this also helps minimize the potential for implant rotation and malposition. and Experience is Critical – Because of the differences that exist between round gel implants and the anatomically shaped Natrelle 410, specific patient evaluation, planning, and surgical techniques are required when using the 410. Proper surgeon education and preparation are therefore necessary to achieve satisfactory results with the Natrelle 410. 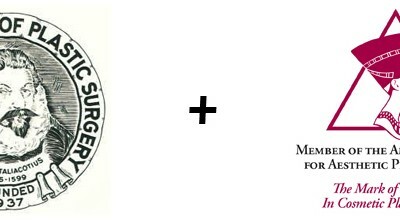 Allergan requires surgeons to complete a certification program, which includes instruction on appropriate surgical techniques and patient selection, before they are able to offer the Natrelle 410 to their patients. Dr Dembny is a certified user of both Natrelle round gel and 410 breast implants.